(by Rob Crilly, London’s Daily Telegraph) New York — Former rival Ben Carson backed Republican presidential front-runner Donald Trump on Friday, becoming the second former presidential candidate to support the billionaire businessman in the race for the White House. Dr. Carson, a retired neurosurgeon who dropped out of the race on March 4, follows New Jersey Governor Chris Christie, a former candidate who also backed Trump after earlier dropping out of the race for the party’s nomination ahead of the Nov. 8 presidential election. Dr. Carson made the announcement at a joint news conference with Trump in Florida, ahead of that state’s primary on Tuesday. 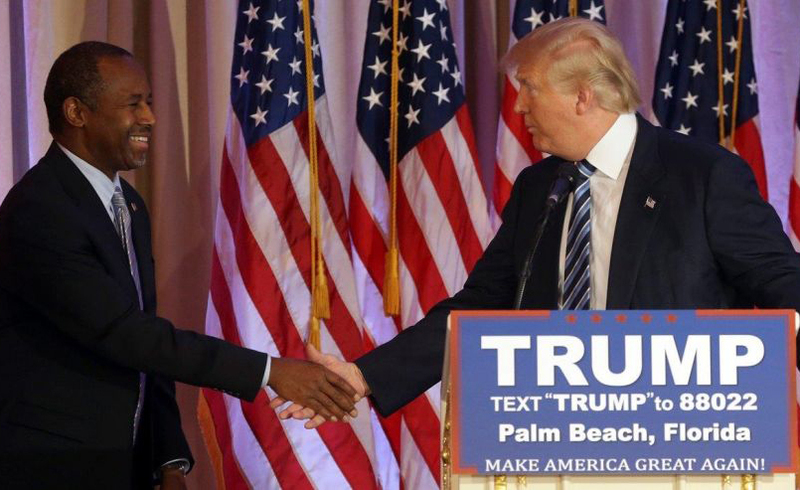 During Thursday’s Republican debate in Miami, Mr. Trump revealed he had spoken to Dr. Carson earlier in the day. Dr. Carson told Fox News radio that he was leaning towards the Republican front-runner. He previously revealed that he has had several telephone conversations with the property magnate, despite Mr. Trump directing a number of withering attacks his way during the campaign. His apparent decision suggests he now believes Mr. Trump offers the best chance of winning November’s general election. The endorsement will be the biggest for Mr. Trump since Chris Christie, governor of New Jersey, put his weight behind the front-runner at the end of last month. Although Dr. Carson is a less established political figure, his backing could be more decisive. And Mr. Cruz, the Texas senator who is the closest rival to Mr Trump, considers the conservative Right to be his own territory. Losing Dr. Carson’s endorsement makes it even tougher for him to prevent the front-runner from snatching the nomination before the summer’s party convention in Cleveland, Ohio. The first test of Dr. Carson’s impact could come when Florida and Ohio – two states with winner-take-all primaries – vote on Tuesday. 2. Name the former presidential candidate who was the first to endorse Donald Trump. 3. Dr. Carson is a highly respected pediatric neurosurgeon. In 1987, he gained world-wide recognition as the principal surgeon in the 22-hour separation of conjoined twins. After acknowledging his expertise in medicine, Donald Trump said he will get his advice in what other area of expertise? Why does he say he will do so? 4. For what main reason has Dr. Carson endorsed Mr. Trump? What effect do you think Dr. Carson’s endorsement will have on Donald Trump’s campaign in the upcoming primaries? Explain your answer. CHALLENGE: Watch the short video clip from Dr. Carson’s endorsement of Donald Trump. 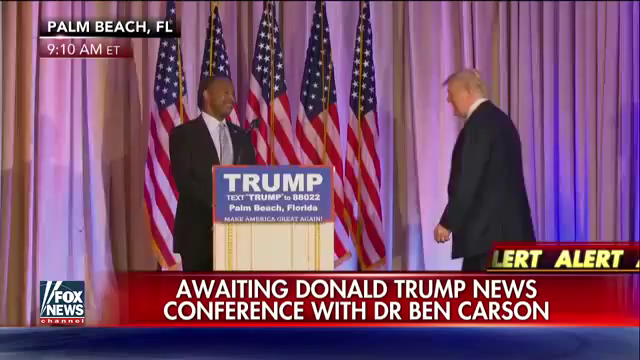 a) For what reasons does Dr. Carson say he is giving Donald Trump his endorsement? b) Tone is the attitude a speaker takes towards his/her subject. What was the tone of Dr. Carson’s comments about his support for Donald Trump? c) Does Dr. Carson’s endorsement cause you to change your mind about Donald Trump? Explain your answer. NOTE TO STUDENTS: Support for a particular candidate or political party is a controversial issue for many Americans. Be polite to those with whom you disagree when discussing your support for or opposition to a candidate and always give the other person a chance to explain his/her point of view. Also, learn how to recognize when it is no longer productive to discuss an issue on which you strongly disagree.